I am hiking up a seldom-used trail into a high, wooded mountain valley. My pack is light, and the movement feels good. Though it rains off and on, my rain gear works, and I am comfortable. At times the trail is so faint I lose it, but the lay of the land is a good guide, and soon I find it again. The trail crosses through a numbingly ice-cold stream. It was a snow bank just shortly before, after all. Since I am alone, this heightens the element of risk and sharpens my awakeness. I have no particular goal for this trip, so I allow myself long breaks where I settle with a sense of quiet comfort and ease. 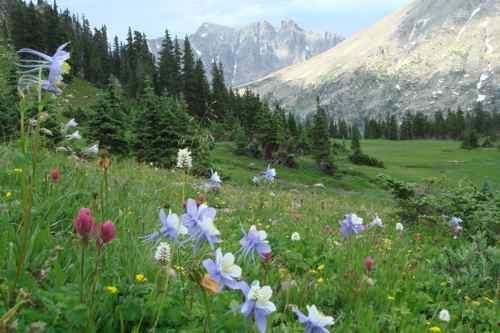 Eventually, the valley opens into a meadow dotted with flowers and low rock outcroppings. Ranging from rusts and deep oranges to various day-glo greens made all the more vivid by the rain, lichen covers the rocks. At the upper edge of the meadow, I set up a camp where I’ll stay for a few days. I string a tarp between two low granite rocks, prop my head on my pack, and stretch out my feet crossed at the ankles. I feel settled and relaxed. Reflecting on it now, I recognize feeling cradled and held. I am at home. I spend the next couple of days wandering near my camp. As time slows down, my fascination with the world gets deeper and more alive. To borrow a phrase from Robin Wall Kimmerer’s lovely book, Braiding Sweetgrass, I feel like I am remembering things I didn’t know I had forgotten. The stunning clarity of a drop of water at the end of a pine needle just before it lets go. The majesty and pure substance of the high peaks. The radiant generosity of the sun. Such perceptions arouse many rich associations, but soon I am out of words. I am in more direct contact with this place. A cluster of delicate wild iris. Wisps of clouds forming and dissolving in a deep blue sky. Mist rising off sun-warmed rocks. The night sky as the clouds part. I have periods of boredom, agitation, grief and anxiety, as well. My time here is multidimensional and real, not an idealized fantasy. Still, I am finding more intimacy and immediacy. Increasingly, I am simply here. For many people, nature is one of the most direct and powerful portals to presence. But what is “nature”? It depends on our view. Who or what are we taking ourselves to be? And what or who is nature? The answers to these questions also shape how we feel about the state of the environment and how we are moved to act. Surely there is a better alternative to reactivity or denial. I believe the Diamond Approach can help us with these questions, giving us deeper connection to nature and to presence while also clarifying our actions on behalf of the natural world. Here are five responses to the underlying question, what is nature? Nature is a danger, an obstacle or a nuisance that needs to be conquered and controlled. Nature, both outside our bodies and in our own untamed wildness, is a problem. The more we remake the world according to our preferences and the more we can remove it from our everyday lives, the better. Nature is a commodity with value for humans and should be developed or preserved. We may see nature as a resource whose benefits are primarily economic. Although wild nature is not useful in and of itself, it does have utilitarian potential that should be harnessed, exploited, or developed. Or we may see that nature has many other benefits. It is a kind of amusement park, rec center, museum, therapist’s office, temple, or church. We are then moved to protect wild nature for others use and for future generations. Although these two views can look and feel very different, both see the natural world as an object to be used for human ends. While this can be the source of important environmental conservation, it also perpetuates the objectification of nature as something to be preserved and protected. Nature is our home. All creatures are family, and nature is to be loved and cared for as one would care for family. This view recognizes what many of us feel deeply – the intrinsic value of nature and a sense of deeply-bonded kinship with “Grandmother Earth and all her children.” Without thinking twice, we make sacrifices for those we love, including the Earth. Such love is a powerful motivation for environmental action. Nature is self, and our actions on behalf of the Earth are a kind of self-regulation. Humans and nature arise from the same source in Being; we are nature, and our actions in service of the Earth are simply the Earth caring for itself. In this nondual view, our task is to be as transparent as we can so we can hear the voices of nature and respond without egoic self-interest. Environmental “shoulds” are replaced by deeper realization and action, and moral pleading is replaced by invitations. Here, superego coercion, anxiety, judgment, or blame dissolves, and environmental action arises as a natural part of serving being. As we continue to expand our consciousness of human-nature relationships, we might even discover a view-that-is-not-a-view. There is no human-nature relationship, and there is nothing to be done. Beyond concepts of nature and human, there cannot be a relationship. “Relationship” entails two, and here we find simply an open field and a profound, vast freedom. There is nothing to do, and this is where “real action” begins. The Diamond Approach’s view of totality teaches us to see each of these perspectives with freedom from fixed hierarchies or preference. There is more depth, aliveness, potential, and sustainability in some of these than in others, and they definintely have implications for how we feel and act. At the same time, we are invited to acknowledge all views, both dual and nondual, narrow and expanded. On the last night of my backpacking trip, my companions are a sleeping bag, tarp, dry socks, a hard rain, and the simple arising of nature in all its forms. With no sense of obligation or pressure, I lie awake for a long, delicious time before drifting off to sleep. The next morning I wake hearing two words: “I love.” Startled, I look around for who might have said it, and I realize it was me! The words are inseparable from a warm sweetness in my chest, utter satisfaction, and unfettered gratitude. There is no more to the sentence and no object of that love, just “I love.” This boundless, unconditional love is utterly complete and fulfilling. Then, I remember Rumi’s phrase: No better work than work with no purpose. No better love than love with no object.